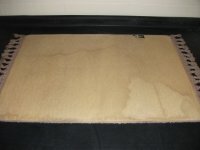 Nylon Area Rug Cleaning - From Shabby To Like-New Again! 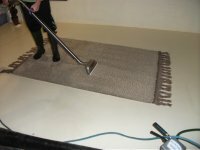 There is a process to area rug cleaning regardless of fiber type or construction. 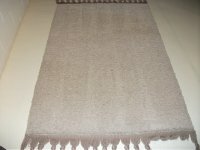 This Nylon rug is no different in it's basic construction than the Nylon carpet in your living room. 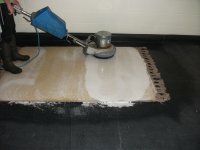 The rug has a primary and secondary backing with latex in between the two. 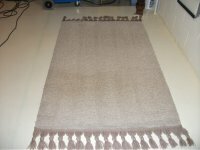 The sides have been serged and a decorative fringe has been placed along each end of the rug. You can see how soiled this particular rug is. It sits in the entry of a local business, and as such, it takes a pounding. Especially throughout a long cold winter! The first step in cleaning any rug, after careful inspection, is vacuuming and dusting. First, we slowly vacuum the face of the rug, making several passes over all areas. Then we turn the rug over and vacuum the back of the rug. This is done slowly and repeatedly. Then the rug is pulled back to clean the floor. Here's a picture of the results of the first dusting. The picture below shows the results of the second dusting. We'll repeat this until soil stops dropping out of the rug face fibers. When we reach that point we'll turn the rug back over and do one final vacuuming of the face fibers. 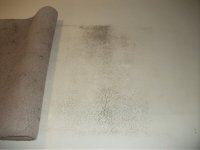 In addition to the soiling on the front of the rug, the backing was quite stained from getting wet repeatedly. After vacuuming our first step was to precondition the rug's backing with a water-miscible citrus co-solvent. 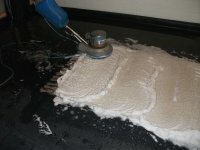 The co-solvent functions as a surfactant, making it easier for us to completely "wet out" the rug. This is desirable for a full thorough cleaning. 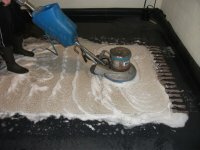 Here is a picture of the rug backing after pretreatment. Notice all the staining. The next step is to shampoo the back of the rug utilizing a rotary machine with shampoo brush. The shampoo is fed from the tank on the rotary down to the brushes. Here are two pictures of us shampooing the rug's backing. After shampooing the back of the rug, we turn the rug over and repeat the process for the front of the rug. After being shampooed, the rug is completely submerged in our wash pit and rinsed until the soil and the shampoo stop coming out of it. Much to my chagrine, I didn't take pictures of this step with this rug. 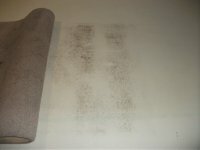 Don't worry though, we have pictures of this step on our rug cleaning process page. 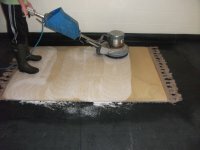 Following rinsing, the rug is rolled up again and placed over in the finishing area where it is extracted. We really take our time on this step because it is so much easier to extract water than it is to dry with air movers and dehumidifiers. 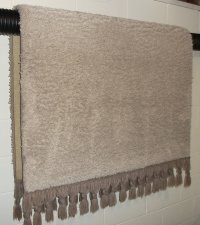 After extraction the rug is hung to dry and any necessary fringe detailing is performed. 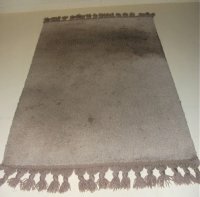 Separate rug fringe cleaning can frequently be avoided if thorough cleaning has been achieved beforehand. 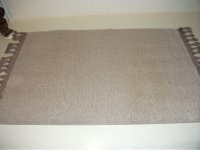 Here are some pictures of the finished product, both the front and back of the rug. Remember how horribly stained the back of the rug was? The last step is to wrap and tag the rug for delivery.